Trip Hazard Repair Service | DIY or Professional Sidewalk Repairs? Knowing when to hire a trip hazard repair service over attempting to do it yourself is important for saving money, time, and hassle. 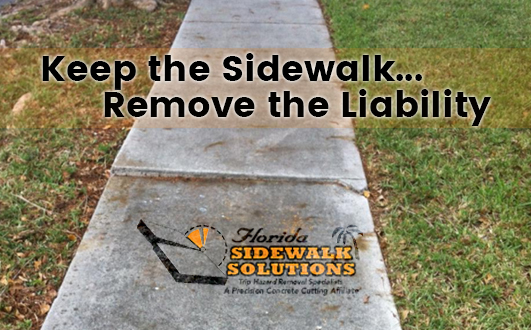 Although it may seem tempting or even cost-effective to repair concrete sidewalk cracks on your own, it could end up costing you more without any real liability benefits. 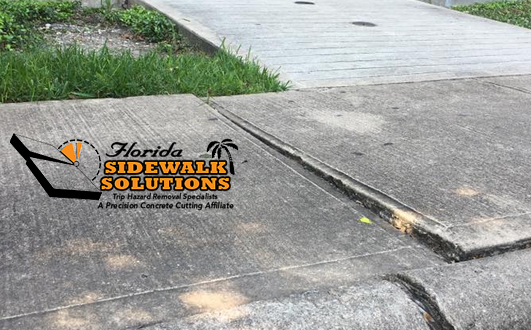 An experienced sidewalk repair company can properly repair uneven or cracked concrete sidewalks and remove any of the liability that a damaged walkway can cause. 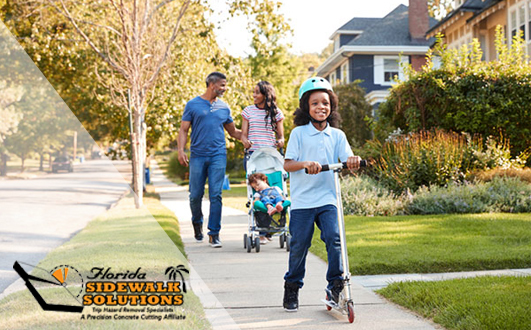 These professional sidewalk repair companies have the knowledge and resources to truly revitalize some of even the most weathered concrete sidewalks. 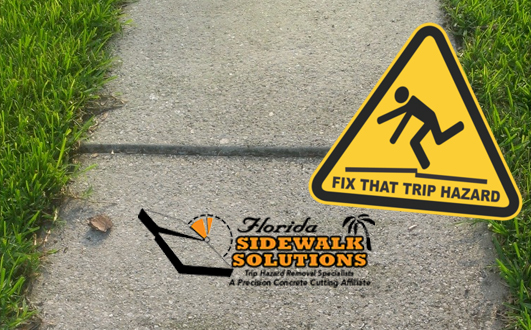 Continue reading to further understand why it is important to consider an experienced trip hazard repair service when it comes to repairing uneven or cracked concrete sidewalks over attempting to do it yourself. 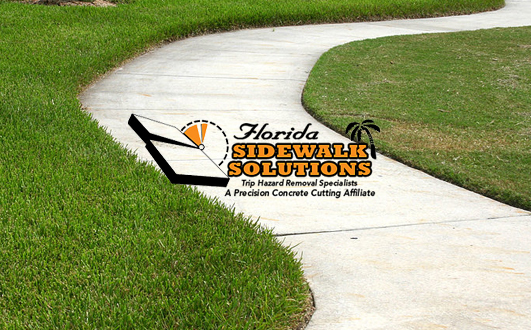 If you have any further questions and would like to speak with an experienced team member, be sure to contact Florida Sidewalk Solutions today. A trip hazard is not just a nuisance. 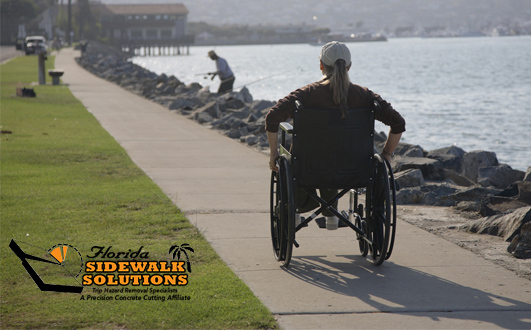 It is legally considered by the Americans with Disabilities Act as any uneven walkway that has an incline of greater than a quarter inch. The Americans with Disabilities Act, or ADA, considers a trip hazard as a serious public safety hazard that should not be ignored. Depending on the kind of property you manage or own will determine what this means for you. A trip hazard on a business, commercial, or residential property that causes an injury could make that property legally liable in the event an injury occurs. The ADA can directly involve itself in a case which could escalate the seriousness of the situation a business may be involved in. The property could face extremely high fines and legal punishment in court. 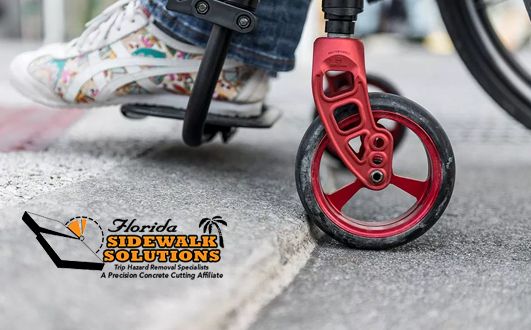 Acting on an uneven or cracked concrete sidewalk quickly by hiring a trip hazard repair service can protect a property from possible liabilities and a serious intervention by the ADA. 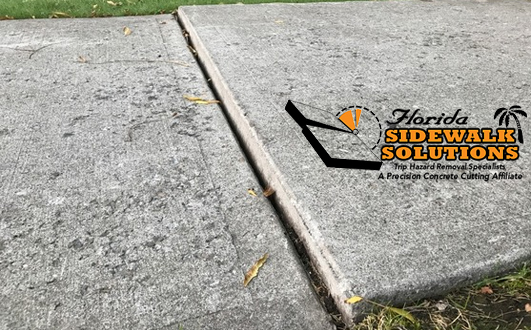 Unlike an incomplete do-it-yourself sidewalk repair job, a professional concrete sidewalk repair company uses state-of-the-art concrete cutting equipment to completely remove any trip hazards present. 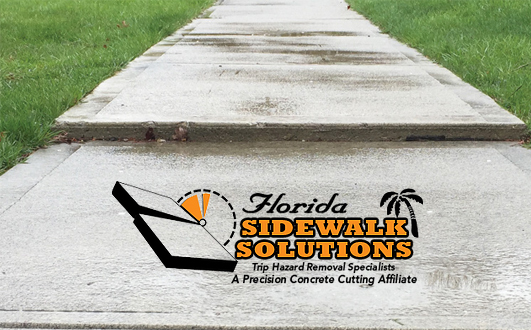 Not only will the sidewalk be precisely leveled but it will also receive a slip-resistant surface for added safety and protection. A trip hazard repair service can also do all this with little to no disruption of the area. It is important to remember that this kind of repair is far more cost-effective when compared to completely replacing the concrete sidewalk. 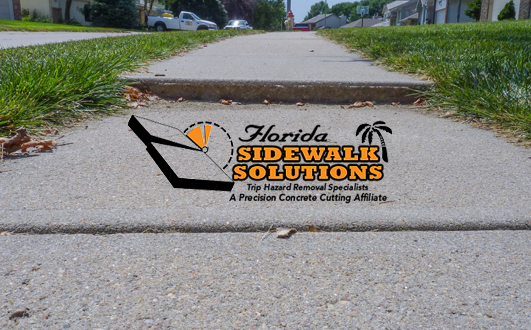 A professional sidewalk repair company uses concrete cutting equipment that can completely remove trip hazards in a timely fashion while ensuring your property is protected from liability. 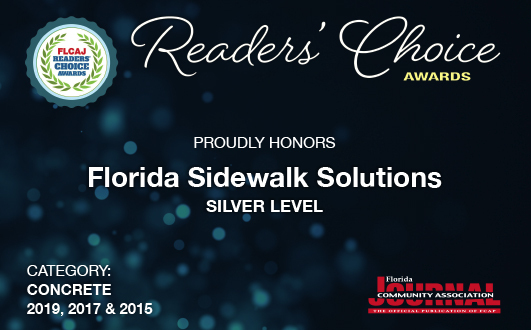 South Florida residential, business, and commercial properties have come to rely on Florida Sidewalk Solutions for the highest quality trip hazard available. 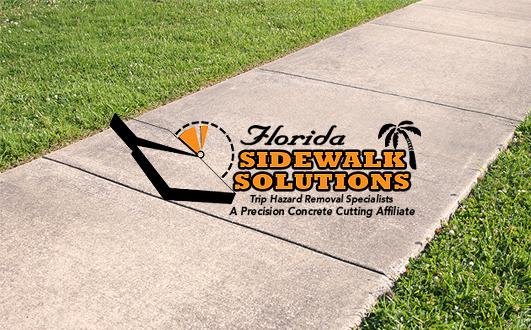 Our experienced team of professionals uses only equipment equipped with the latest concrete cutting technologies to precisely remove any trip hazards present while saving you hassle and money. 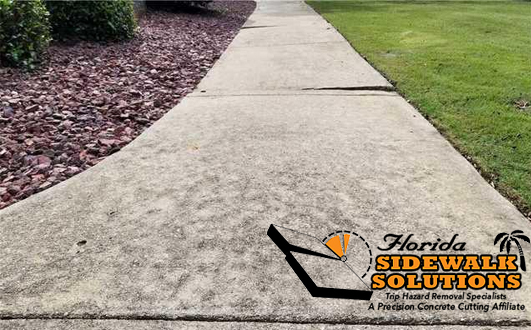 Be sure to contact us today for a free estimate to remove the trip hazards on your property.